Our “Frontline battle ground ” 250SS-WARS scoop from the May 2018 special edition (Released for sale 24th March) has been published by Indonesian motorcycle media. References made to our CG images often circulate the internet, but this time it actually went into printed form. 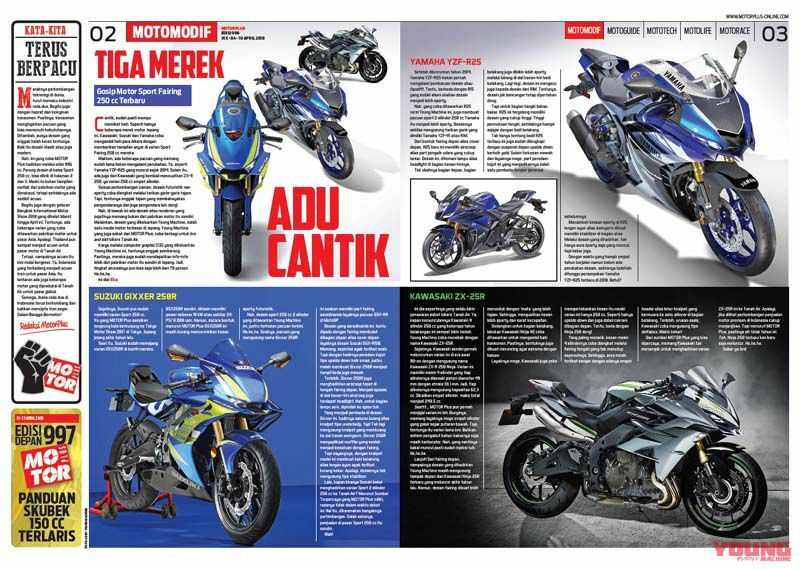 In a country that has many passionate sports bike fans, the specialist tabloid newspaper “MOTOR PLUS” in Indonesia is very well known, and recently it published an almost like for like scoop of ours from the May edition. The published article has appeared thanks to our joint business relationship, and shows how there is much hype over there for 250cc sports bikes. As expected for a country that produces the CBR250RR, the trends of other rivals becomes a big matter of interest. So here we are going to introduce a section of the scoop that was also published by MOTOR PLUS. Here is the MOTOR PLUS special edition front cover and inside pages of the 250cc sports bike scoop taken from our May edition. 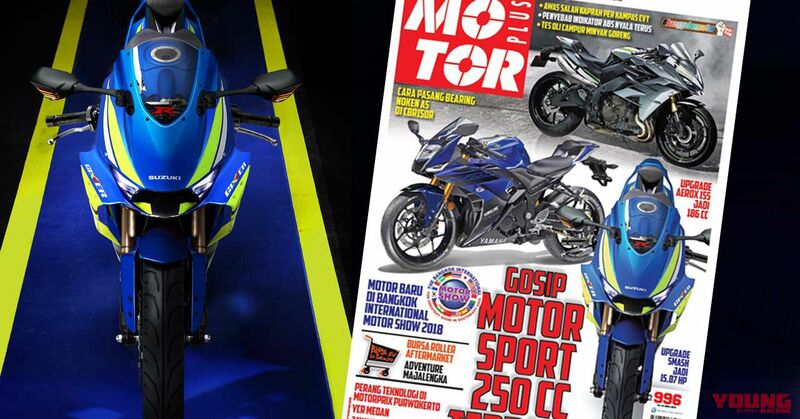 “MOTOR PLUS” is known to be the biggest bike media in Indonesia, and around 200,000 copies are printed in weekly publications for a price of about 55 US cents. We have published the content from the article about the Suzuki at the top in the space below here. Is this Suzuki 250 going to be a killer ultra-lightweight “oil cooled” sports bike?! Suzuki had continued to be in the red with its motorcycle production, but thankfully managed to get itself back into the black as of late. (Based on the second half of the fiscal year from April – September of 2017). In particular, the Asian regions are turning over favourably. 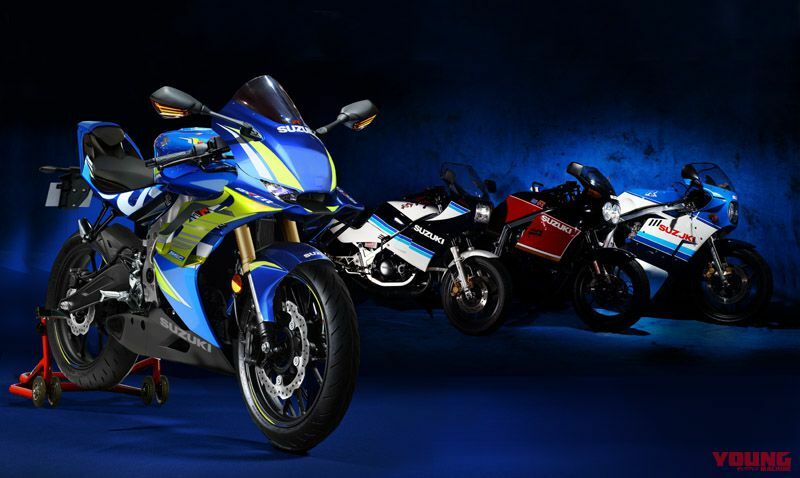 The release of the GSX-R150 was a big hit in Indonesia, so it seems this made a large contribution to sales. From our standpoint too we are truly glad to hear about this, and whilst the going is good we very much hope this allows for new styles to be created amongst the 250 sports bikes. At present Suzuki have the GSX250R in the same class as its rivals, but the others clearly differentiate in character and practical use. Such is the case that fans have been waiting a long time for the next generation of 250 sports bike from Suzuki. Well, after having made some enquiries we have come to hear the rumour of how a new “oil cooled, single-cylinder sports bike is in the midst of planning”. When it comes to oil cooled Suzuki’s, we all tend to think of it as an old boys favourite, as you come to associate it with the GSX-R750 lineage that conquered the endurance races in the eighties. Undeniably, the strong points of oil cooling is its “lightness”. Also, it needs fewer parts than water cooling, and on top of being lightweight and compact it can all be accomplished at low cost. It also draws close with water cooling in terms of cooling ability, and of course fuel consumption is better than air cooled machines. Even when it comes to power it can be hoped that it will be somewhat equivalent to a water cooled machine. Furthermore, if this bike is produced as a single cylinder unlike its twin cylinder rivals, then due to the effect of synergy it will be lighter. The water cooled one cylinder Ninja 250SL is 15kg lighter than the lightest twin, the CBR250RR. In the case that it’s oil cooled, make no mistake the weight can be lessened much more. The bike is expected to take the name of “Gixxer”, which is a popular name in the heart of Asia for bikes, India. We predict that it will be the next version of the flagship Gixxer (154cc) from over there, that is focussed on being ultra-lightweight. (SUZUKI GIXXER 250 CG scoop. Expected time of appearance: Autumn 2018. Price range: TBC. Chance of being released: 50%) When one says gixxer it refers to the nickname of GSX-R, so that was how the bike got the same name in India. The naked edition of the gixxer is also sold regularly in Japan as it imports them from India, so there’s bound to be many people who will recall the name. 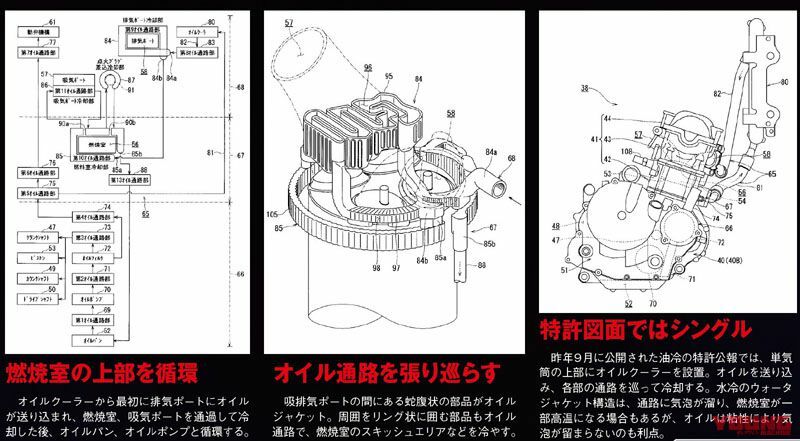 There have been patent applications made one after another by Suzuki regarding oil cooling, which supports the “rumour”. This became evident from 2016 as information has been announced intermittently regarding domestic patents, and in September of last year there were patents made public for features like oil cooling passages in the vicinity of the combustion chamber, and for a recycling oil jacket to be created in-between the intake and exhaust ports. The aim is to strive for an engine that suppresses the combustion chamber temperature, so that the intake efficiency improves and the power output is increased. Beginning with the first generation of GSX-R750, traditional Suzuki oil cooled engines have used the cooling method of spraying oil into the combustion chamber via a nozzle from the inside of the cylinder head. Whereas, if you look at the series of patents released in recent years, it is supposed that a more simple and highly effective system can be created by making the oil recycle at high speeds. At the 2015 Tokyo Motor Show, Suzuki exhibited an oil cooled 50cc scooter concept, and this also used the recycling method. It appears that developing a new oil cooled model is ambitious. Incidentally, one of the reasons that Suzuki decided to call the bike a “Gixxer”, is because the patent also has plans to attach a sari skirt guard for Indian women who wear the skirts. This oil cooled Suzuki revival is ahead of the times, and is something we have been longing for! (Right) In the patent information released September of last year regarding oil cooling, an oil cooler is installed above a single cylinder. The oil is fed in and passes around all parts to cool the engine. In the case of a water cooled, water jacket construction it collects up passing air bubbles, so in some cases the combustion chamber reaches high temperatures. However, the advantage with oil is due to its viscosity the air bubbles don’t remain. (Middle) Oil jacket bellows component in-between the intake and exhaust ports. Its environs are surrounded by a circular ring component that allows oil to pass through, and this cools things like the squish area in the combustion chamber. (Left) First of all, oil is fed in from the oil cooler to the exhaust port, then passes through the combustion chamber and the intake port. After cooling these areas, the oil pan and oil pump do the job of recycling.